ArtTechDesignInc carries these LedgeLokr shelves with secret compartments. The top shelf remains level, while the bottom swings down to reveal the interior contents. Barenz Builders included this secure gun storage room the Venecia estate, complete with it’s own reinforced vault door. A user on AKFiles posted these pics of their Pepsi machine that they gutted and turned into a secure gun safe. From the outside no one would suspect anything other than tasty beverages filled this machine. 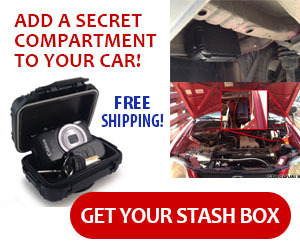 This vehicle has a custom secret compartment for long gun under a false floor behind the rear seat. This BMW 2002, featured on Jalopnik, has a secret gun stash compartment for a pistol in the dash. This coffee table from Walmart includes a secret long-gun storage compartment underneath the lift up top. The cabinet is fully lockable and contains two pull out drawers as well. This in-wall gun safe from Walmart is a cost effective way to securely store rifles and shotguns.